In Memory of Aunt E.
Sometimes it’s the people you assume will be with you forever that pass away unexpectedly. 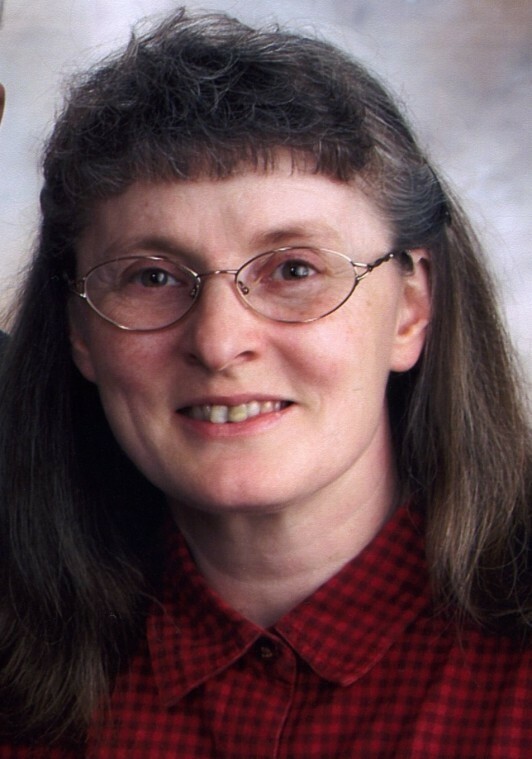 Last fall, my Aunt E –farmwife, book lover, and lifelong lover of learning—went to be with her Lord at a young age. After she died, I began to reflect on just how much influence my aunt had on my life. Especially in the arena of books. Uncle B. once gave his wife a stack of the Ripley’s Believe It or Not (from the old original series), which he’d scoured the local used bookstore for, and she enjoyed them just as much as if he’d given her flowers. 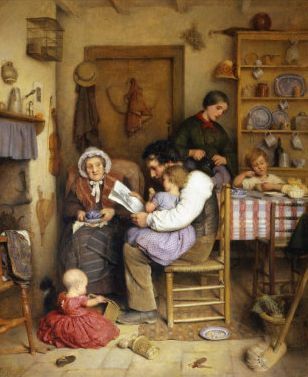 It was not uncommon to see my aunt and uncle reading during their late supper-snack, after they’d come in from the barn chores. Aunt E. loved learning anything and everything she could get her hands on to read. From history, psychology, to nature, it was said during her eulogy that she voraciously consumed nearly the entire local library. During the years 2006-2007, she read 216 books, –quite a feat, considering the amount of farm duties she took care of on a daily basis. Of course, audiobooks were a large part of her literary diet. Being so busy with farmwife duties, she often checked out audiobooks to listen to while canning peaches, cleaning house, or doing dishes. I remember riding with her home from the library while she popped in a cassette of “Jeeves and Wooster,” which was the first I’d ever heard of it. My aunt and uncle didn’t have tv, but she knew about so many subjects just from reading/listening that she often was more informed about topics than others in conversations. She knew as much (if not more so) about the scandal surrounding the Prince of Wales and Lady Di than we did after we’d watched a documentary on tv about it. My aunt kept up a long-distance letter correspondence with my sister and I when we were growing up. That definitely exercised our writing skills! It was always the highlight of the week to find a letter in the mailbox from her. We talked about so many things. One time I wrote to her all about how scared I was to move, and in her responding letter she reminded me that ‘This is not our home; we’re just passing through…’ I think she liked to read about all the girlhood experiences we were having growing up. We liked to hear her unique thoughts on all types of things—from Christmas music to vacations, to Victorian dresses and politics. And books, of course! Her first influence on me when it came to books was sending a box full of paperbacks to take along with me on a summer vacation camping trip to New York. I can’t remember what any of them were anymore, but I remember the gesture. 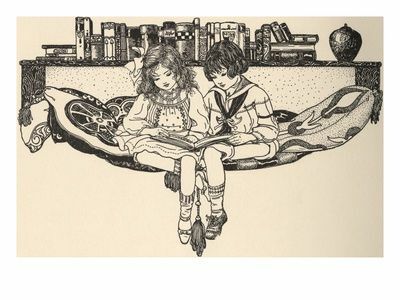 If it hadn’t been for my aunt’s suggesting, I might not have discovered such books as: “Anne of Green Gables,” “Betsy, Tacy, Tib,” “Daddy-Long-Legs,” and “Laddie.” “Every girl needs to read the Anne books before she grows up,” she told me. And she was right. She also said that Mark Twain’s “Tom Sawyer,” and “Huckleberry Finn” were best enjoyed as an adult. My aunt and uncle didn’t have any children of their own, but they had many nieces and nephews. Her sister’s children (not related to us) were much younger than my sister and I, and their mother didn’t always have time to read to all of them at the time, so my aunt came up with an idea. They sent me her children’s picture books and asked me to tape record the stories and send them back for the kids to listen to and follow along. I loved doing that so much!! I probably had more fun than the kids did listening! And it also was my first experience in reading on tape for someone else. Now I have moved on to Librivox, but it was my aunt’s idea that made me realize it was a dream for me to pursue. My sister and I stayed for several weeks at my aunt’s house the spring my grandmother died. I was 15 years old and needed a book to read to pass the time. I wandered down to the back living room, to the built-in bookcase beside the fireplace and decided to try a faded purple volume of “Jane Eyre.” I loved it! I spent many hours engrossed in the story of Jane and Rochester. Years later, my aunt gave me that very copy when she was ‘weeding out’ to make more room for other books. Aunt E. told me she wished she’d spent more time reading the classics when she was growing up, but at the time she was only interested in horse stories. As an adult, she often said her favorite books were “Laddie,” by Gene Stratton-Porter, and the “All Creatures Great and Small” series by James Herriot. She said she’d listened to the latter so many times on audiobook she had it memorized, and that when she finally got the chance to watch the tv series, she knew what the characters were going to say before said it! Her annual Christmas letters definitely showed a James Herriot influence. She usually had some sort of animal story to tell, farm drama or other tidbit to share, and could spin it in such a humorous way that people often anticipated next year’s letter. People told her she ought to write a book. Sadly, that didn’t happen. Aunt E didn’t like sad endings (I remember she gave up an audiobook early on in the story because the main character’s beloved aunt died). It was a shock to all of us when she became very sick several months before she passed. But she bravely faced her own mortality—because she believed that those who belong to Christ Jesus are promised an ultimately glorious ending… which happens to be the beginning of another and Better Story. It probably started when I was a little girl first learning to read Amelia Bedelia. I was older by my sister by 3 years and so had a great advantage over her in that I could read ‘real books.’ I would read “Geraldine’s Big Snow”, “Kidderminster Kingdom Tales“, and “Alexander and the Terrible Horrible No Good Very Bad Day” to her because I loved to read all the expressive words. 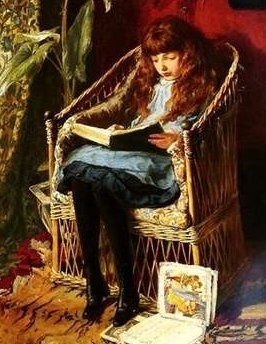 Little Sister eventually learned to read, but somehow reading aloud didn’t stop. We got older and I discovered Nancy Drew. I’d read a whole mystery out loud for us on a rainy Saturday afternoon. We’d pitch my pup tent out in the backyard during the summer and we excitedly devoured Frank Peretti’s Cooper Kid mysteries. Then we got older and it was the Father Brown mysteries I got for Christmas one year (I think S. just wanted to hear my unrealistic British accent more than anything!). When we were in our late teens/early twenties, our family went through a long moving ordeal during which we forwent a tv for a while. Ever since we were small, S. and I had learned the skill of being our own entertainment. 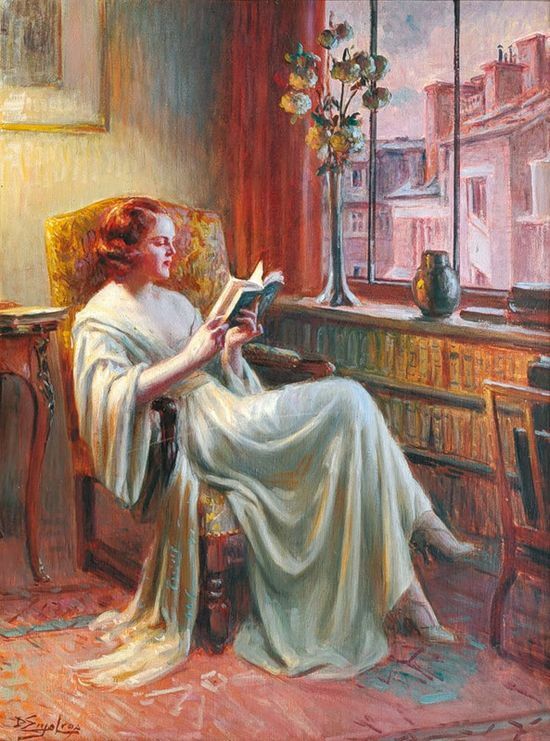 So, in the evenings we sat in the living room and I read Agatha Christie mysteries (Why Didn’t They Ask Evans and The Body in the Library among others). There is something memorable and delightfully homespun about reading out loud in a family setting. Yes, it does feel a bit awkward at first, especially if you don’t view your family as anything particularly resembling The Waltons. To be honest, to this day I don’t feel completely comfortable reading in for a live audience. 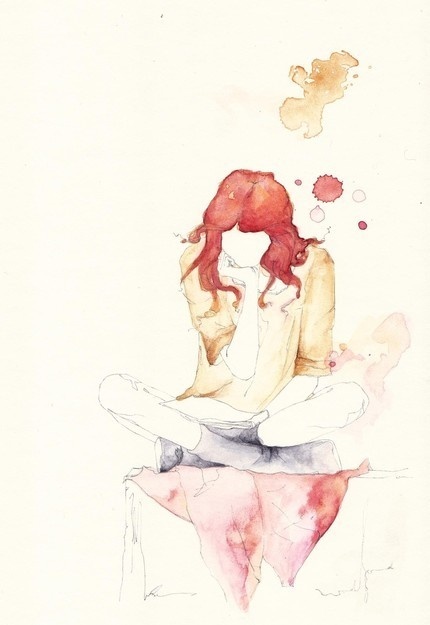 Being an introvert causes an internal self-critic to warn me against letting myself go “too much or I’ll feel stupid.” I feel ridiculous trying to put on voices or accents, I fear mispronouncing a word, I hate reading the kissy scenes, and on and on. I don’t read perfectly. But you know what? Looking back, I have all of these wonderful memories of reading to my Mom and sister when we were still all living together. Families change as the years go by, but remembering that we did something other than watch the latest Law and Order: CI episode makes me feel like maybe we did have our Walton moments. It sort of gives me a cozy, reminiscent feeling that is precious. Click on the picture for a wonderful article on the same topic! It is rare in this day and age. It’s much easier when you start young or start when you’re kids are young. Reading books to kids at bedtime never grows out of date. 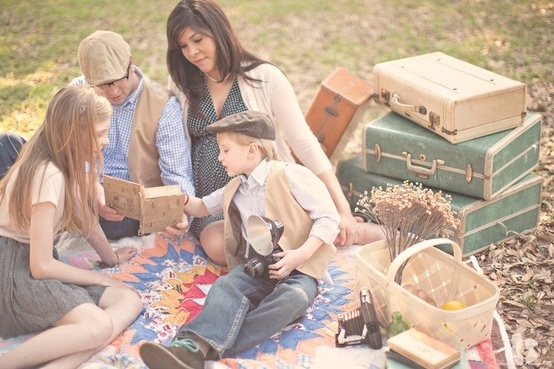 Can you remember a parent, grandparent, older sibling or someone who read you bedtime stories? I think we’ll realize if we ponder long enough that it wasn’t the story so much that we loved the most. We’d heard that Peter Rabbit story so many times we had it memorized! No, it was the person who was reading it to us that mattered. Hearing the voice that cared so much about us that they spent the time to read out loud, no matter how tired they themselves were. It was hearing the excitement in their voice as they enjoyed the story right along with us. It was like that moment of time was the only thing of importance, and nothing else existed outside of experiencing the story together with someone else. This wasn’t something that could be tangibly felt or put into words at the time, but looking back you see how precious that was. We have the opportunity to pass along the same kinds of memories! The big secret is that bedtime stories aren’t just for the kids. Adults love them just as much. Timeless stories that stand the test of time, like fairy tales or E. Nesbit. We can enjoy exploring those story worlds with the next generation. But reading aloud doesn’t have to be only for children. Aging parents, grandparents, the bedridden or anyone who has ears to hear can enjoy being read to. The unspoken message is that is says someone cares enough to spend time sharing a story with someone else. You might be in a phase where there isn’t much else to talk about with each other, but you can connect through a story. In a safe, loving atmosphere, gradually stepping out to read to the people you love can boost self-confidence. When you hear that first word of encouragement, that first positive laugh over the way you read a humorous line, that “Stop that! You’re scaring me!” …you will bless yourself for taking up the idea of trying! Affirmation can make one feel like they can do anything! Reading aloud is a constructive, imaginative, and creative art. Edith Schaeffer, in her book “The Hidden Art of Homemaking” suggests it as an outlet for acting. She says that if you’re a person who had always dreamed of being an actor but never had or took the opportunity, reading out loud to the people nearest you will give you a feeling of fulfillment. You can be creative about this. How about reading to each other for a romantic date idea? I knew of someone who read “Anne of Green Gables” to her college dorm mates on weeknights while they pampered themselves in the bathroom. Perhaps you’re one of those lucky people who can read during long car rides without getting motion sick. 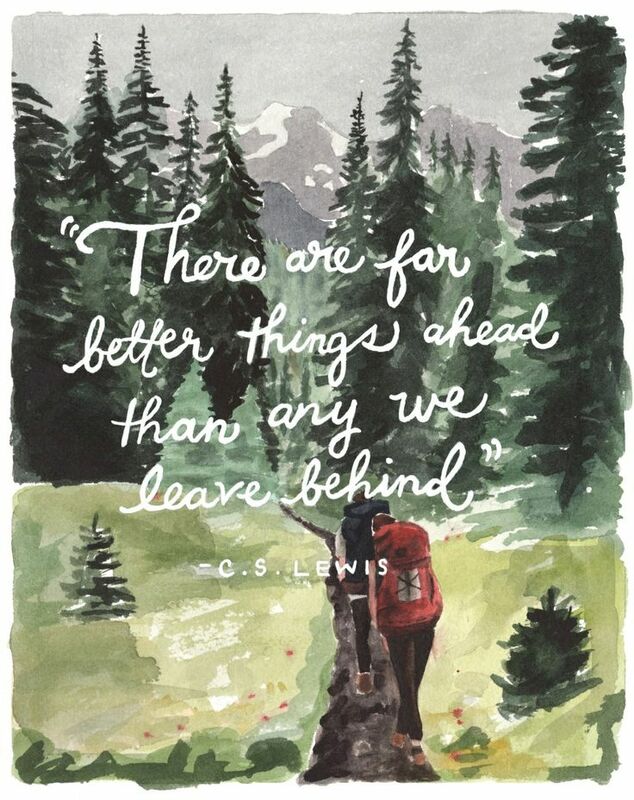 Read about the sights you’ll be seeing, the history of the places you’ll be going. When my sister and I were homeschooled, Mom read the history of Genghis Kahn while us girls shelled peas. My grandma and grandpa started up their church’s library and personally read every book they entered into their card catalog system. In this way they discovered The Mitford Series, by Jan Karon which they took turns reading aloud to each other. One summer when I came down with poison ivy really bad, my mom read Tales of the Kingdom by David and Karen Mains while I soaked in a ginger bath. My friend’s mom refused to let her children see the Lord of the Rings until the had completed the trilogy together as a family. Their goal was to read each book before they hit the theater. Antsy listeners who can’t keep still while being read to can enjoy the story just as well (or even better) when they have a quiet activity like putting together a puzzle, working on crafts, building models, etc. Children might want to act the stories out with their stuffed animals as they are listening. I always listened to a good story with a blanket thrown over my head to block out all distractions. There is no right or wrong way of doing this. If you’re still shy about trying this, there are other ways to enjoy reading aloud to others without the live audience. Librivox.org is a wonderful way to read in community! I once recorded a set of children’s books on audio cassette for some children whose mother didn’t have time to read to them. It’s a great way to start out and practice at, before offering to read with others physically present. It requires commitment to complete a story, making time out of everyone’s schedules, patience and courage, but whatever you do, don’t let life slip by without discovering this wonderful pastime! Plot Summary: (from Barnes and Noble.com) During the tumultuous reign of James II, Englishman Peter Blood, a gentleman-physician, barely escapes the gallows after his arrest for treating a wounded rebel. Sentenced to ten years of slavery on a Barbados plantation, Blood escapes from captivity and boldly embarks on a career as a pirate, never losing sight of his goals of clearing his name and returning to England. A rollicking tale of piracy on a grand scale, accented with breathtaking maritime maneuvers, near misses, and broadside hits, Sabatini’s fast-paced novel is alive with color, romance, and excitement. 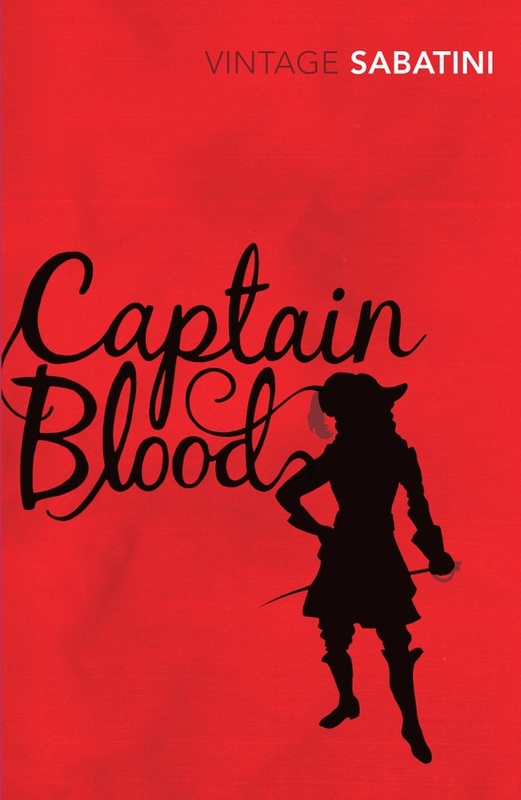 A swashbuckling classic that brims with stolen treasure and adventure on the high seas, Captain Blood quickly became a best-seller after it was first published in 1922. My Book Review: I’d been planning on reading this oldie classic for several years, but truth be told I was expecting a shallow dime novel type story. I ended up being pleasantly surprised. Rafael Sabatini was inspired to create his most famous literary hero from the story of a real-life person named Henry Pitman, but added a great deal more swashbuckling adventure to the tale. It definitely felt like a fun historical fiction adventure novel, complete with all the melodrama of an early black and white movie. I loved the sarcastic wit and humor of Peter Blood, M.D. Just plain fun to read and has enough action and humor to keep you from getting bored! The story is not without romance, and includes one of the cutest romances I’ve ever read that was written by a man. I can’t really find anything to complain about. Peter Blood does swear like a pirate (but that could just possibly be because he is one). Nothing so modernly hair-raising! I had a little trouble trying to picture how Blood should look, though. 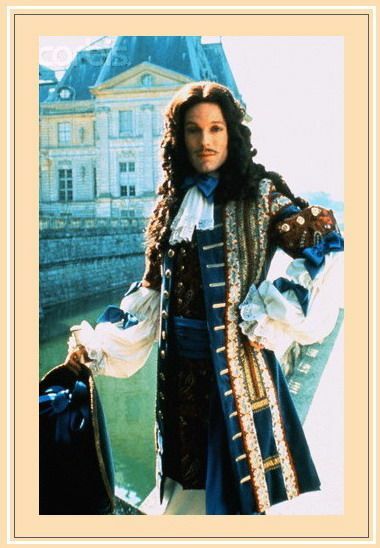 Finally about midway through the story, I settled on an image of Richard Chamberlain from the old 1977 “Man in the Iron Mask” movie– he’s the only one I know who can look good in a black periwig! Apparently, the second two are not sequels, but are accounts of Blood’s adventures that chronologically occurred within the timeframe of the story in the first book. When I was in middle school, you would never recognize me without a book. I didn’t have any friends to hang out with, and if you were unoccupied you were fair game for the bullies. So having a book was my way of escaping and avoiding, I guess. I could pretend I was someplace else, and could totally become oblivious to the world and noise around me. When I was 13, my mom and dad chose to homeschool me (and contrary to a common myth out there that homeschoolers lack social skills, I came out of my shell, learned to socialize, and made friends… but that’s a different story for a different time). Homeschooling means a lot of required reading. A lot! So I could take my book history book on the Vikings to my bedroom and it was there that I learned to read out loud to myself. Perhaps you could make a case that my ‘reading aloud career’ started when I was 4 or 5 years old—when I narrated my picture books on the tape recorder that my mom provided to keep me occupied. I think I was actually obsessed with the red light on the record button. Then, as I grew older and learned to read simple children’s books for myself, I would record those. In 6th grade, I would read my history homework assignments out loud to myself. I think this might have been because I remembered what I was reading more. And I read lots of Nancy Drew books to my sister, so I’d much practice reading for an audience, but it wasn’t until I was homeschooled teenager that I started reading aloud just for myself. I started practicing honing my diction and enunciation. I don’t really know why I started doing that. Perhaps it was the perfectionistic side of me. However, drilling this into myself at an early age certainly has made it a lot easier and it sounds a lot more natural now. I don’t have to think twice about it, or make a concerted effort. This is why I think it is important for children to learn the art of reading aloud. It was as a teenager while learning to read the classics that I discovered my genuine love of vocal reading. This article will be the first in a series about the importance of reading out loud, or “The Art of Reading Aloud,” as I like to call it. Because it is an art. And a fun one at that! For me, reading the stories out loud makes them seem more real. They come alive! It’s like the difference between eating vanilla ice cream and eating Coldstone Vanilla Ice Cream with butterfinger candy bars, carmel, and graham cracker crust mixed in! Plain vanilla is nice, and some people may prefer it better for special reasons. But the other kind with all the extras adds dimension and crunch and gooiness. You don’t know what you’re missing until you try it! I now find it nearly impossible to comprehend and really involve myself in a good fiction story, without reading it out loud to myself, or at least whisper read if I have to be quieter. I suppose this is because I am listening to my voice acting out the emotion of the story. I feel it enables me to experience it at a deeper level. I get easily distracted trying to read silently. I start skim reading, which doesn’t enable me to experience it by half. I also like to listen to the words. I like to feel the sound of them slip up from my throat and over my tongue. It makes me appreciate the words the author chose when I can hear them put together! So, here is an exercise that I encourage anyone reading this try if you never have before. Next time you sit down to read, read just to yourself alone out loud. Choose a place and time when no one will be around to overhear you and make you feel self-conscious. 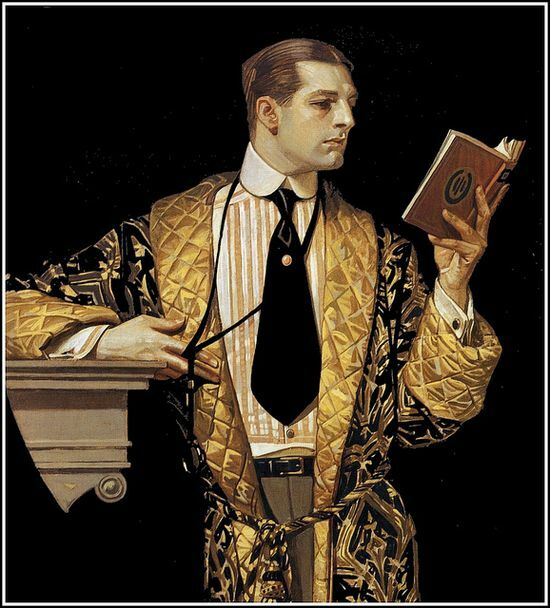 In some future post, I will submit tips and links to fun websites where you can learn to improve the art of reading aloud. I am not a professional audio book narrator (though that is my dream) and I do not know everything on the subject; I only hope to pass along what I learn to you. But right now the point is to just jump in and try it, mistakes and all. No Internal Criticizers allowed! You know… the voices that whisper in your ear things like, “You sound so stupid. You can’t even pay attention to the story because you’re paying so much attention to how stupid you sound. You don’t sound interesting. You don’t even know how to pronounce that word. You can’t make a believable British accent…” Yeah, yeah, I’ve heard those from myself, too. But you seriously aren’t going to let that stop you from enjoying life more, are you? Who cares if you don’t sound ‘interesting’? Tell yourself right back: “So? I’m just starting out and no one else can hear me. I’m learning. I’m just having fun and playing around. I’m not setting out to win an Audi Award.” It’s just like learning to do anything else, like piano or tennis. So first thing, learn to get comfortable reading to yourself. Have you ever listened to your own recorded voice? Although this is hard to believe in today’s media age, a lot of people have never heard themselves. Please, please try this if you haven’t! If you have, you may feel inhibited because you don’t think you have a “good” voice. Some people even loathe hearing their own voice, not because it really sounds all that bad, but they hate listening to themselves! This is so sad, and I think it stems from a form of self-hatred that needs to be overcome. You can gradually learn to improve the things you don’t like about your voice. All voices have their pros and cons and no one is perfect, but everyone has something positive about their voice! My Mom doesn’t like how her voice sounds so low, but if you’re female and you have an alto voice, it makes it easier to read the male characters’ voices! My Grandpa doesn’t like how his bass voice has gradually gotten higher pitched as he’s aged, but I enjoy listening to his peaceful, mellow voice. But keep trying, keep practicing, keep doing! Just pretend as though you’ve been a professional audio book narrator your whole life. Starting out with confidence makes a world of difference. After a little while of gained confidence and learning to improve, you won’t hear those voices in your head anymore. I think another reason why I love to read out loud is that there is an unfulfilled acting desire within me. And reading aloud is that—acting. More specifically, it is storytelling to yourself! You don’t have to stress yourself out about really performing over the top for yourself (but as you have more and more fun, I hope you will!). If doing voices and accents really isn’t your thing, no one says you have to. But try and let yourself go! Does getting a hoarse voice inhibit you? I find whisper-reading the narration and only speaking aloud the dialogue helps a stressed out voice. I don’t know much on this subject, I’m just throwing it out there, but some find that reading out loud helps them with dyslexia and ADHD. Visiting the free downloadable audiobooks on Librivox may help you get over some of your inhibitions and inspire you to volunteer yourself! Just ordinary volunteers reading books in the public domain, like a good friend reading out loud to you on a Sunday afternoon on the back porch! I hope to have a future post on reading aloud to others. If you have already discovered the joy of reading out loud, feel welcome to share what you love about it! Plot Summary: A king of England is selected from alphabetical order to rule as he sees fit. It just so happens that the man chosen, Auberon Quin, lives for one thing in life: humor. 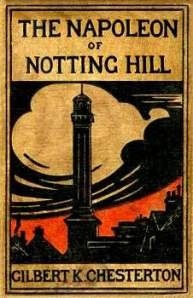 But when he orders road developers to tear up the little “insignificant” district of Notting Hill, the locals who are led by one fiery young man do not see the joke. No one could have predicted what ensues. There were things I could appreciate and glean from it, though. The main theme: How much is your home worth to you? How far would you go to defend it and everything that is good and dear and lovely about it? I could resonate with this, after having lived in an area where there were those who were quick to build windmills in the very places that meant the most historically and aesthetically to us. I was glad I read this book after all, as it was one to make the brain work and think. But it wasn’t what I would call pleasure-reading. Those interested in Chesterton, or those looking for a brain-stretcher will appreciate it most. You can listen to a free downloadable audio book version of the book here. Trivia: What do “The Napoleon of Notting Hill” and “Downton Abbey” have in common? Chesterton published his book in 1904, and several years later it inspired one Irishman, Michael Collins, to lead the fight for Irish independence in the early 1920’s—the same political upheaval in which Downton’s Tom Branson was involved in.